We’re living longer and longer. Well, some of us. The researchers, a group of 13 prominent economists and health policy experts 1 , tried to figure out how long Americans can expect to live based on their income, focusing on earnings in midcareer, from 41 to 51, and using Social Security data. The results are stark. In 1980, a 50-year-old man in the wealthiest fifth of the income distribution could expect to live five years longer than a 50-year-old man in the lowest-income group. By 2010, the gap between them had jumped to 12.7 years. 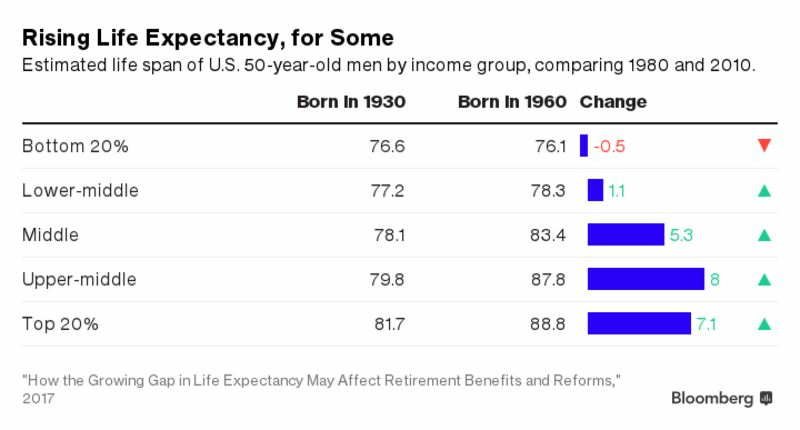 In other words, the poorest fifth of 50-year-old American men can now expect to live just past 76, six months shy of the previous generation. The richest 50-year-olds should make it almost to 89, seven years longer than their parents' generation. The study focuses on men because the researchers considered the data on women less reliable. 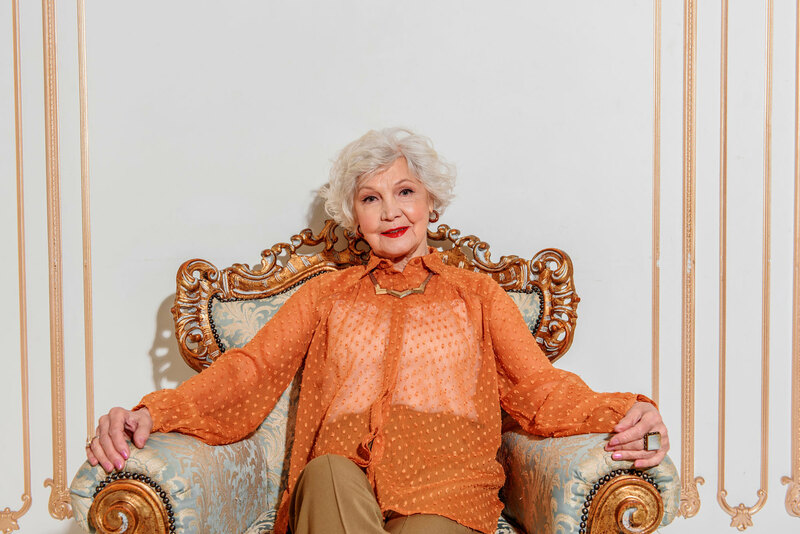 Women's move into the workforce over the past 40 years can skew the numbers, for example, because earlier generations of women sometimes had low reported earnings while having a relatively high socioeconomic status. While the researchers weren't prepared to produce specific estimates for women, though, they were confident that women experienced a “similar if not larger change over time” compared with men, citing a previous analysis. One important result of this 13-year life expectancy gap: Social Security and other government programs, such as Medicare, are becoming a much better deal for well-off Americans. 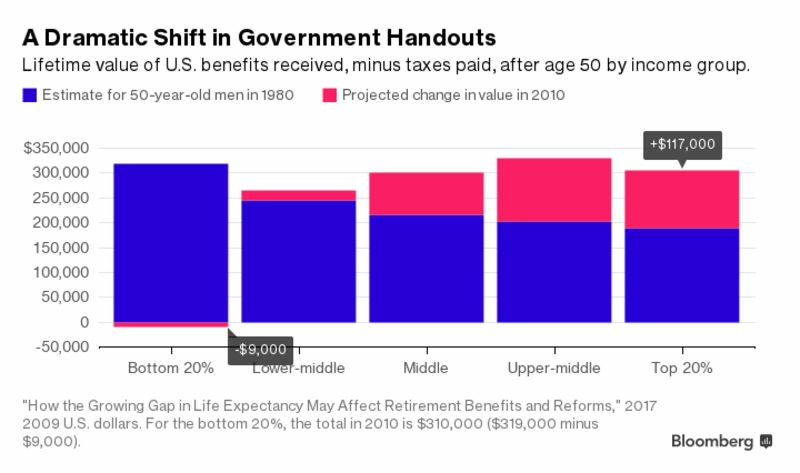 Three decades ago, the richest and poorest retirees could expect about the same amount of benefits out of government programs. 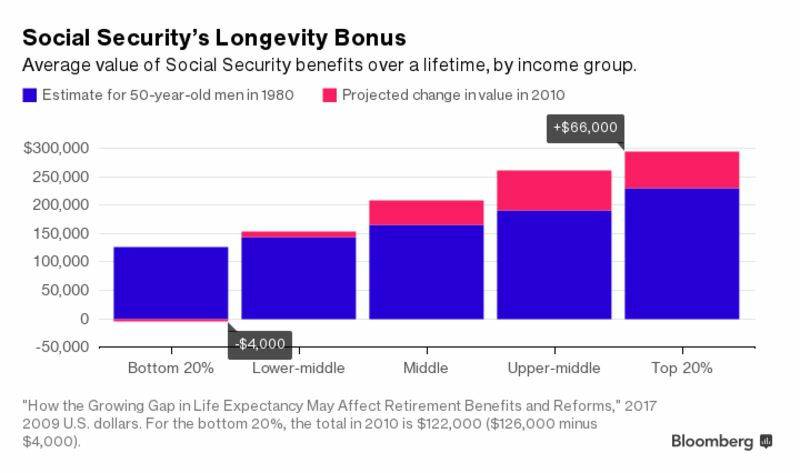 The richest generally got larger Social Security payouts, both by qualifying for higher checks and by living longer. The poorest got more out of other programs, such as Medicaid and Social Security disability insurance. Medicare offered about the same benefits to rich and poor. The math has shifted dramatically. As wealthier people live longer, they can expect to collect much more from Social Security over their lifetimes than the poor. This chart shows the growing gap, based on the present value of benefits to a 50-year-old looking ahead, and using 2009 U.S. dollars to account for inflation. In 1980, a wealthier 50-year-old could expect to collect $103,000 more than a poor American. Thirty years later, the gap was $173,000. “These results suggest that Social Security is becoming significantly less progressive over time due to the widening gap in life expectancy,” the researchers write. The U.S. retirement system looks more even-handed if you include in the analysis all government benefits received and all taxes paid by Americans after age 50. Still, longer lives are giving the rich and upper middle class a big financial boost, especially through Medicare and Social Security, even as the poorest Americans lose ground. There are several theories on why the health of wide swaths of the U.S. is getting so much worse while the wealthy are thriving and living so much longer. Some cite rising levels of substance abuse, obesity, and suicide. Others point to the ways economic inequality drive health inequality. The cost of good health care has skyrocketed, even for people who are technically covered by insurance. Your expected life span is obviously a factor when planning and saving for retirement. The longer you live, the more valuable Social Security is as a safety net to supplement your savings. Life expectancy trends also affect the long-term finances of entitlement programs such as Social Security. For the moment, the most pressing question is why so many Americans are dying young, and how to stop it.